This section starts with a water crossing - Tuross Lake forms another major barrier and, while its entrance can sometimes be waded at low tide, it is best to wander down to the boatshed on the lake where, for a donation, members of the Tuross Rescue Squadron, might take you across in their zodiac. It is a pleasant way to reach the other side. Once there, an easy walk along the sand spit and short climb takes you to Potato Point, another small coastal holiday village. Re-entering Eurobodalla National Park, you quickly reach Jamison Point with great views down the length of Brou Beach to the ever closer Gulaga (Mt Dromedary). For the next 6 km, the beach is your highway as you wander past the broad sandbar that separates Brou Lake from the sea. 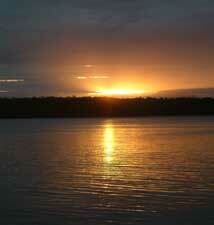 Eventually the beach ends at Dalmeny, perched between the still waters of Mummaga Lake and the ocean. To the south of Dalmeny lies another 4 km long stretch of beaches, separated by sandstone ribs and platforms jutting out into the sea. Eventually, the imposing granite walls of Narooma’s breakwater come into sight – protecting Wagonga inlet and its fleet of fishing and leisure craft from the ocean swells. Here you follow a wooden boardwalk along the northern shore of the inlet to reach the bridge that takes you into Narooma itself. This large coastal town is a good place to stay. 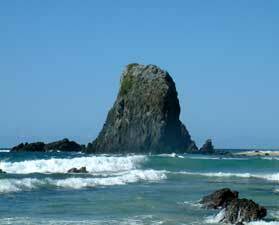 Leaving Narooma, you can wander beside its famous cliff-top golf course that leads to a spectacular view over the off-shore pinnacles of Glasshouse Rocks. From here, you drop down on to the beach and, at its end, either take a low tide route around the rock platform or a high tide route along the cliff-top. Either way, you emerge on to Handkerchief Beach and, at the southern end, a shallow wade of a creek brings you to Barunga Point. Here, a set of poles guides you along the cliff-top pastures of Jindamar South property. This is a lovely part of the walk, with panoramic views up and down the coast, a backdrop of blue-tinted mountains and a string of small coves, while, out to sea, the lighthouse-capped profile of Montague Island lies on the eastern horizon. Leaving the pastures for another long stretch of beach-walking, you reach the rugged rocks of Corunna Point. A short climb up to the top of the point and a short wander through the forest brings you to Mystery Bay, its waters protected from the ocean by a cluster of outlying rocks. Continuing southwards through coastal forest, you emerge onto 1080 Beach, which takes you past the sandbar of Tilba Tilba Lake and onto pasture-covered cliffs, which provide views of two mountains sacred to the aboriginal people – Gulaga and Mumbulla. The long stretch of Wallaga Beach leads you towards the rocky cliffs of Morunna Point, but, before reaching it, you can either cross the sandbar holding back Wallaga Lake or go a little inland to cross its inlet on the road bridge. Once across, the walk follows the Bermagui Coastal Track around and through the dense paperbark thickets of Murunna Point, with views of its rugged rocks jutting out into the sea. Then, turning inland, you soon reach the shores of tranquil Wallaga Lake, framed by the silhouette of sacred Gulaga – a great place for a break. A recent development on this part of the walk has been The Yuin Cultural Heritage Trail, with a series of interpretive boards explaining the importance of particular sites to the aboriginal people - it is a chance to learn more of the people who have called the South Coast home for more than 20,000 years. Retracing your footsteps back to the coast, you rejoin the Bermagui Coastal Track and follow it along a disused and overgrown bitumen road, past the waterbird haven of Long Swamp to reach Bermagui. This town, with its quaint old buildings and boulevard of palms, is famed as a game-fishing centre and is the end of the section. 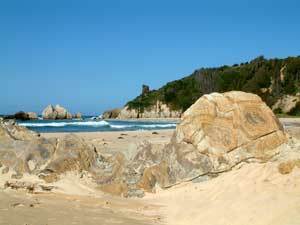 The rocky headland south of Glasshouse Rocks Beach might only be passable at low tide. I suspect that the land on the cliff top is private - needs checking out.